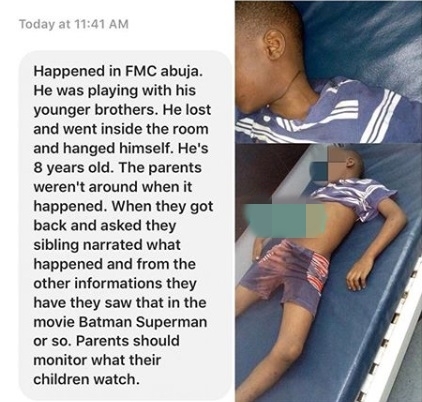 Some of the residents of Abuja have been left in total shock after a teenage boy who lost a game to his siblings, took his own life. The young boy committed suicide by hanging himself at the federal capital territory, Abuja, after losing a game to his siblings. “He was playing with his younger brothers. He lost and went inside the room and hanged himself. He’s 8-years-old. The parents weren’t around when it happened.